The following is a collection of our observations over the years, and noteworthy news items. Click in the images for more information. 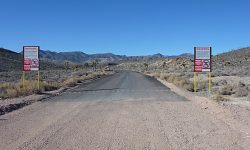 For a much more in-depth look at Area 51 history please see Peter Merlin's excellent DREAMLAND Timeline article. Late March/Early April 2019: The road just inside the Area 51 Back Gate was secured against intruders with removable hedgehog-style barriers. 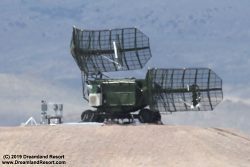 Late March 2019: A new Russian radar site was added near the Area 51 Back Gate. Jan-Apr 2019: A massive construction project is going on at TTR. For three months, dozens of belly dump trucks deliver material to TTR every day. Satellite images show construction around the south end of taxiway Alpha and taxiway Bravo. But the amount of material suggests other construction as well. 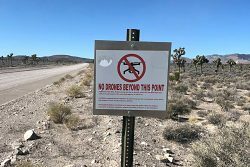 Fall 2018: In the Fall of 2018 new "No Drone Zone" signs were posted at the boundary of the Area 51 airspace, which extends for a couple of miles onto public land around Groom Lake Road. If you plan on flying drones around Area 51 please be sure to read our article explaining current restrictions. May-Aug 2018: The Las Vegas Janet terminal is undergoing an expansion. The addition in the NE corner of the terminal appears to be a two story building. 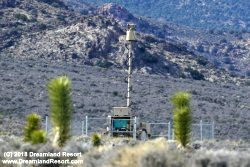 2017: More FLIR cameras were installed along the Area 51 perimeter in the area north of White Sides, near the "Bald Mountain Gates". September 2016: Some changes around the Groom Lake Road Guard Shack: Most notably the old guard shack has been removed. The gate area is now reinforced with concrete barriers and a new large fuel tank was added behind the new building. And it appears the garage behind the guard building has been replaced by a similar, but taller garage. December 2015: The warning signs at the Groom Lake Road "gate" have been replaced with new signs. All of the old signs are gone. There are identical new signs on either side of the road now (see below). No more "Deadly Force", but instead the new signs make it illegal to fly drones in the area. The line across the road is now clearly marked and the border a few hundred feet on either side of the road is marked with razor wire. A new mobile, remote-controlled camera tower now sits next to the road a short way inside the perimeter. November 2015: The new hangar reported under construction in August 2014 appears to be completed and possibly in use. A June 2015 image still shows it in the final stages of construction. Image Terraserver. October 2015: The Air Force seizes the Groom Mine overlooking Area 51 after failed negotiations with the owners. The mine was the last private property with a view of Area 51. August 2014: A new very large hangar is under construction at the south end of the southern taxi way in 08/2014. Construction started in 06/2014. The footprint on satellite images is about 215x215ft. The height is about 85ft. 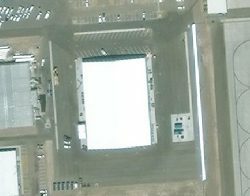 At this point it is not clear whether this will be a hangar housing a new secret project at Area 51 or a scoot-and-hide shelter or possibly a new covered trim pad. A new ramp connects the hangar with the taxi way on its north and south end. May 2013: The large building west of the Janet ramp appears to be complete. A February 2013 satellite image still shows some construction in the surrounding parking lot. Due to its proximity to other new administrative buildings it is most likely an administrative building or a new dining hall. Image Terraserver. February 2013: The four older water tanks on the hillside have been removed between 05/2012 and 02/2013. Only the three new, larger tanks are left. Late 2012: A network of at least 9 new remote controlled security cameras on concrete pads was installed in a valley east of the Groom Mountain Range and Bald Mountain. This part of the Area 51 boundary faces Hwy 375 and is most likely to be visited by curious tourists. These so-called FLIR cameras are night-vision capable. Trenching for the camera cables all the way from the GL Rd Guard Shack to the "Bald Mountain Gates" can be seen in a May 2012 Terraserver image. A January 2013 satellite image shows the pads complete and camera towers on at least some of the pads. Image Terraserver. 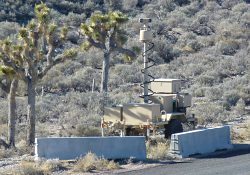 Similar cameras were installed at the Back Gate in 2013 and at the Groom Lake Road gate in 2015. 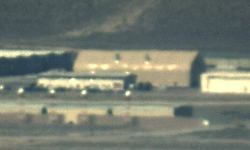 May 2012: The new engine test hangar aka "Hush House" near the Area 51 North Ramp appears to be complete. 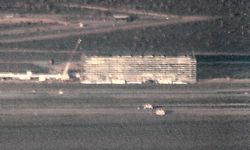 A satellite image taken a few days earlier shows the construction being wrapped up. Image Terraserver. May 2012: A new water tower was constructed between 08/2011 and 05/2012. The old red-and-white water tower was removed between 05/2012 and 02/2013. May 2012: A new hangar was built on the north side of the North Ramp, north of Hangar 6, between 08/2011 and 05/2012. May 2012: A new quonset hut was constructed near the gravel pit, just north of the concrete plant between 08/2011 and 05/2012. August 23, 2011: Our new satellite photo shows beginning construction of a new hangar east of the existing North Ramp. Construction was finished in 05/2012. 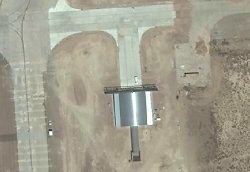 Recent satellite images and our latest Tikaboo Panorama show that it is an engine test hangar, also known as "hush house". 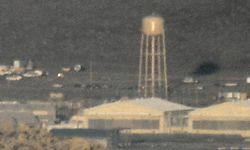 Two similar hangars can be found at Nellis AFB near the helicopter ramp at the north end of the base. August 23, 2011: Our 8/23/2011 satellite image shows construction of a new building with a very large footprint near the new Base Headquarters and the Janet Ramp. It measures approximately 255x184', and appears to be fairly tall. Construction continued until 02/2013. The purpose of the building is not clear. Located just south-east of the new Base Headquarters it could be a new dining hall or administrative offices. But our 2014 Tikaboo panorama shows no visible windows. It could also be storage. There is no connection to the flight line, so it is unlikely that it is an aircraft hangar. 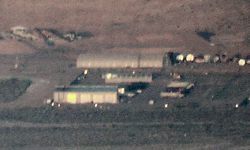 March 2011: Another smaller quonset hut-style building first showed up in a 03/2011 satellite image. It is located south of the dormitories and just south-west of the construction site above. It may be related to that construction. March 2011: In December 2009 and August 2010 we reported road improvements at the Groom Lake Road gate and at the Back Gate. 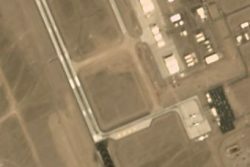 A March 2011 satellite photo shows that some of the roads inside the restricted area have also been improved during the same time period, including Groom Lake Road, the Backgate Road, the road to the engine test cells on the far south end of the base and the access road to a fairly new radio site on a hill on the north-west side of Groom Lake. 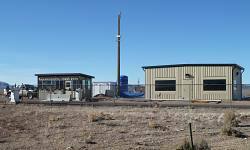 January 7, 2011: A large new Guard Shack is currently being built at the Rachel Back Gate to Area 51. The outside of the sheet metal building is complete, and contractors are busy finishing the inside. The building is about five times the size of the current guard shack, which was built in October 2000. It is located between the current guard shack and the original pre-2000 guard shack. After the paving of part of the Back Gate road last August (see below), this is the second major upgrade to the Back Gate in six months. Clearly this gate is going to see more traffic. 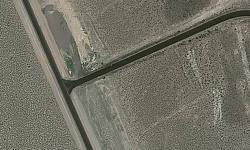 August 21, 2010: The Area 51 Back Gate Road has just been partially paved. The oil pavement is covered with a thin layer of very fine gravel or sand. The pavement goes for 2.2 miles from the Guard Shack to the intersection with a road leading north and eventually back to Hwy 375. The pavement continues up that road for another 0.8 miles and then ends. There is no indication for plans to extend the pavement past that point. 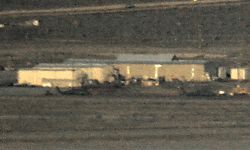 May 24, 2010: Another large new hangar was added at the South Ramp of Area 51 between 11/05/09 and 05/24/10. Ground preparation for the foundation can be seen in our June 29, 2009 Satellite Image. The hangar is located just west of the old Hangar 20-23 storage building. It is most likely connected to the ramp on the south side, opposite another hangar that was added in early 2005. Photo by Jeff Gregos, with friendly permission. December 30, 2009: Between 12/15/09 and 12/30/09 the remaining 9-mile dirt section of Groom Lake Road inside the restricted area between the warning signs and the old cattle fence near the north end of the dry lake bed was paved. Groom Lake Road is now a paved road from Area 51 all the way to the warning signs. The 13.8-mile section outside the restricted area, between the warning signs and Hwy 375, remains a dirt road. 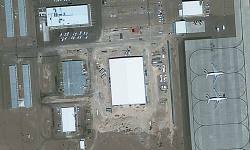 June 2009: Our new satellite image, taken on June 29, 2009, for the first time shows the completed new hangar. Other significant changes include the newly paved north ramp, a new running track, several smaller new buildings and the two new radio sites that we discovered in June of 2008. November 2008 - June 2009: All six of the older Janet 737-200's have been replaced with newer 737-600's, purchased from Air China. The old Janets are currently in storage at the Pima Boneyard in Tucson, AZ. June 2008: The new hangar, south-east of the old south ramp, appears to be finished. The mound of dirt, which partially blocks the view from Tikaboo, seems to be a permanent fixture. June 2008: On June 1st, we discovered a new radio site on a hill north of Area 51. The new site has four towers arranged in a straight line, each with what appears to be a small dome on top. The site is directly in line with the north end of Runway 32(R). The towers are arranged perpendicular to the extended runway. We currently have no further information on the site. A very similar radio site was built just east of the recently extended Hangar 19. The four towers are aligned along the east side of the hangar there. 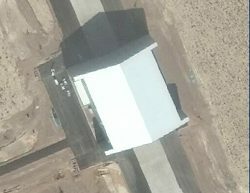 June 2007: New large hangar near the Area 51 South Ramp. A huge new hangar is under construction near the Area 51 South Ramp area. When finished, it will easily be the largest Hangar at Area 51. A large hangar door opening can be seen on the side facing the flight line. Currently a large mound of dirt blocks the view of most of the hangar from Tikaboo. Construction started between January 17, 2006 and June 10, 2007. 2006/Early 2007: New building south of Hangar 18, built between January 17, 2006 and June 10, 2007. This is an extension of the P.E. Building ("Personal Equipment"), where the pilots keep their flight gear, and "suit up" for their missions. Since the South Base area has been expanded quite a bit, it would make sense to need a larger P.E. building as well. Especially with a major new project moving into the new hangar in the near future. 2006/Early 2007: New building at the Explosives Storage Area, built between January 17, 2006 and June 10, 2007. It appears to have a row of windows and a large dark door at the north end. The purpose is not known. February 2006: New Beechcraft King Air 1900C with tail number N623RA added to the Janet fleet. It replaces the crashed N27RA. Photo by Joshua Nyhus, with friendly permission. Winter 2005/2006: A new tall structure was built near the radar range at the north end of the base between Sept. 28, 2005 and January 17, 2006. 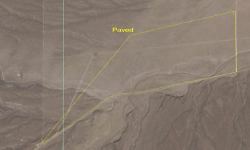 It appears to be a permanent structure, about 180 ft. tall, located at approximately N 37° 14.790' and W 115° 49.392'. The exact function of the structure is not yet known. It may hold a new radar array for RCS tests or other radar measurements. Spring 2005: Hangar 19 extended north and south to triple its original size. A substantial extension was added to the Arm-/De-Arm Hangar 19 in early 2005. In summer of 2005 the hangar has grown to three times its original size. The new additions appear to be open at the bottom. The reason for this addition is unknown. Spring 2005: New hangar built just east of Hangar 9. A tall new hangar was constructed in early 2005, just east of Hangar 9. The height of the hangar, in combination with indications that there is a new UAV project under development at Area 51, could mean that it is used to mount a drone on top of a carrier aircraft. In summer 2005 the new hangar was completed, but there is still construction activity in the vicinity of the south ramp, which has been re-paved in late 2003 or 2004. March 16, 2004: One of the Beechcraft King Air Janets, tail number N27RA, is destroyed in a crash en-route from Area 51 to TTR, killing the pilot and all four passengers. 10/2003: Increased construction traffic through North Gate. Sources in Rachel report a significant increase of heavy construction equipment traffic through the North Gate into Area 51. This may be connected to the construction in the south ramp area (see below). 07/2003: South Ramp is being re-paved. Satellite images show that the south ramp, just north of hangars 9-16, is being re-paved. It seems likely that these hangars, which had not been used for a while, will be used for a new project. 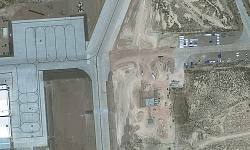 Spring 2003: New Taxiway constructed at Area 51. Construction for a new center taxiway started in early 2003. By summer of 2003 it was nearly completed. Click here for a Satellite Image. Late 2002/early 2003: Two new hangars constructed near the workshops in the west part of the base. Two fairly tall identical hangars were added side by side between the workshops in the west part of the base and the shipping and receiving facility. They are connected to a complex of buildings whose purpose is not known. It appears that the building complex is at least partially fenced in. The fence runs between the two hangars, so that one hangar is inside and one outside the fence. The hangars were constructed in late 2002 or early 2003. 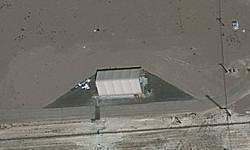 Late 2002/Early 2003: Two large new Fuel Tanks added at Area 51. The older fuel tanks on the south end of the base have been removed, and two large new tanks have been constructed to replace them. By spring of 2003 the fuel tanks were completed. 12/14/2001: Area 51 Security Guards Strike update. The Cammo Dudes are back to work, but their two-day strike caused the delay of a nuclear test at the Nevada Test Site. Click here. 12/11/2001: Area 51 Security Guards on Strike. The famous Cammo Dudes, the Area 51 security guards, went on strike on Monday 12/10/2001 for better pay. They are picketing at the Las Vegas Janet terminal, where they normally board the Janet planes to Area 51. Late 2001: New trucks for the cammos (again!). In late 2001 we received the first reports of yet another new type of Cammo vehicle: Dark gray Chevy 2500 4x4 Pickup Trucks. The Ford F-150's, put in service only in 1999, did not last very long. Since 2002 only the Chevy Pickups and some of the older Jeep Cherokee are in use. 9/17/2001: Radio Site on Flat Top gone. On a routine field trip up to Flat Top we found that the Radio Facility there is completely gone. It may have been replaced by the newer system in different location. 9/05/2001: First Live Broadcast from Tikaboo Peak. As a world premiere, the Dreamland Resort successfully made the first ever Live Broadcast from the top of Tikaboo Peak. 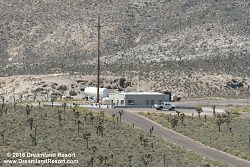 At 8pm PDT a small group of Dreamland Resort team members went on the air to describe the amazing view of Area 51 to hundreds of listeners worldwide on the Internet. 09/2001: Tank Farm at Area 51 removed. Our latest Area 51 panorama photos from Tikaboo Peak in early September 2001 show that the tank farm at the south end of the base has been removed, except for the southernmost two tanks. 05/2001: New Runway 12/30 designated at Area 51. The southern taxiway was designated "Runway 12/30" between 4/16/2001 and 5/5/2001. 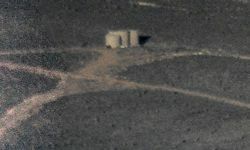 The markings can be seen on newer satellite images. The new runway is 5420 ft. long and 150 ft. wide. Since this is a fairly short runway it will likely be used for UAVs. 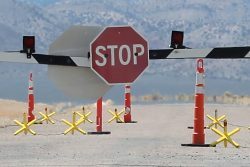 10/2000: Area 51 North Gate security upgrade. The Area 51 North Gate, also known as the Rachel Back Gate, has been upgraded for higher security. There is now a more secure double gate surrounded by a chain link fence, and the guard shack has been moved back inside the perimeter. 04/2000: Area 51 Janet Ramp is re-paved. Satellite images show that the ramp south of the Janet terminal at Area 51 is being re-paved. During the construction Janets use the ramp west of hangars 20-23. 12/16/1999: Area 51 taken over by the US Air Force. An article published in the Las Vegas Review-Journal on 12/16/1999 states that Area 51 was officially taken over by the Air Force. It had been in use by the Air Force before, but was officially under the control of the Department of Energy. Click here for the full story. 10/30/1999: New trucks for the cammos. Since 10/30/1999 a champagne golden '99 Ford pickup truck with 1999 license plates (99B01203) is often sitting on Cammo Hill. This could be the next generation of Cammo vehicles, to replace the white Jeep Cherokees, which mostly have been in service since about 1995. 08/1999: Changes at EG&G. In August, 1999 EG&G Technical Services, Inc. was acquired for $250 million in cash by The Carlyle Group, a Washington D.C. based private global investment firm with industry focus in aerospace, consumer products, defense electronics, environmental services, health care, information technology, the Internet, real estate and telecommunications. The remaining groups of EG&G (NYSE:EGG) changed their name to PerkinElmer, Inc. (NYSE:PKI) in October 1999. EG&G Technical Services contracts for Area 51, providing base security (yes, the famous cammo dudes). It will be worth watching if these changes have any effect on operations at the base, and if there is a connection with the recent takeover by the US Air Force (see below). Thanks to "Bravo X-ray" for bringing the above facts to our attention. June/July 1999: Cedar Gate Road being paved. Cedar Gate Road from State Hwy. 375, mile marker NY 43.6 (just north of Queen City Summit), to the Cedar Gate of the Nellis Ranges has been paved in June / July 1999. It used to be a maintained dirt road before. Now it is a smooth two-lane asphalt road with no speed limit, which suggests a planned increase of activity on that road. We have observed heavy unmarked white trucks entering the Base through the Cedar Gate in October 1999. No information on the cargo is available, except that judging from the large air conditioning unit it needs cooling. We have observed heavy construction equipment being transported into the base on a white unmarked flatbed truck on the Back Gate Road near Rachel in July 1999.